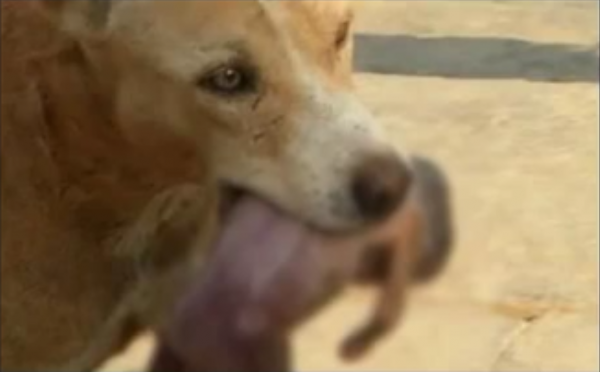 A picture went viral in Saudi Arabia this week, showing a dog carrying a newborn baby in its mouth to take her to a nearby house, where she was rushed to hospital. The Saudi daily ‘Sada’ said it does not know whether the incident took place in the Gulf Kingdom or another country but it added that the dog saved the baby’s life. “Those who posted the pictures said the dog carried the baby to the nearest house, whose dwellers rushed her to the hospital…the baby’s life was saved by the dog,” the paper said, adding that the baby was apparently dumped by her mother near a waste bin. This entry was posted in Animals & Pets, Cool, Featured and tagged Dog saves life, Dog saves life of newborn Baby, Dogs, Lifesaver, Newborn Baby. Baby, Pets, Saudi Arabia. Bookmark the permalink.